Lugarde Kingswood Log Cabin: The Lugarde Kingswood Log cabin is a simple but stylish garden building and is presented as standard with a four panel folding door. The Lugarde Kingswood has an overall depth of 4m, Please see floor plan above. The Kingswood has 44mm wall logs, and the canopy posts are 12 x 12cm. 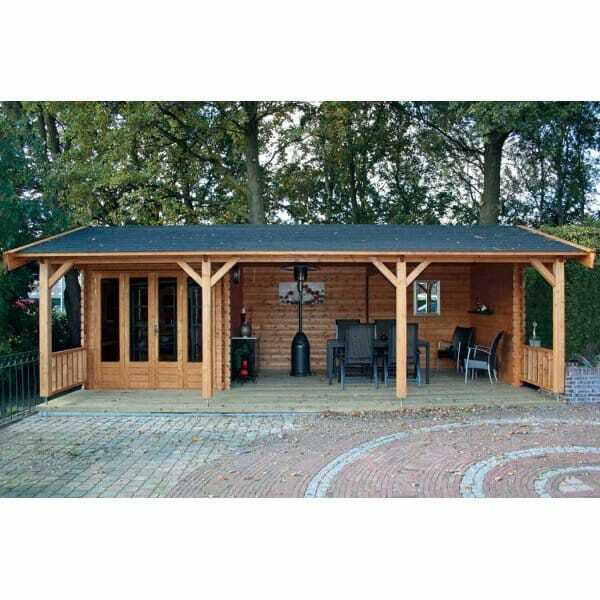 This Lugarde Kingswood Log Cabin offers a 250 x 250 room which can be used in many ways and a large canopy area with solid back and side wall with railing, ideal for dining outside or just a relaxing area to sit in. *Note: In the image this building is shown built on a wooden base. This base is not included. There is the floor inside the enclosed part of the building but no floor in the open area.